Mercury’s dark surface is revealing intriguing new clues about the formation of the solar system, including evidence announced today that the planet closest to the Sun may have formed in part from carbon, a key component of life. A new analysis of data collected by the MESSENGER spacecraft suggests that Mercury’s darkness comes from a form of carbon excavated from beneath the planet’s surface. That carbon may be the remnants of a primordial crust once comprised of graphite floating on a magma ocean. In a paper published online today in Nature Geoscience, the scientists describe how Mercury’s original carbon-rich surface and the planet’s chemistry appear to have evolved. 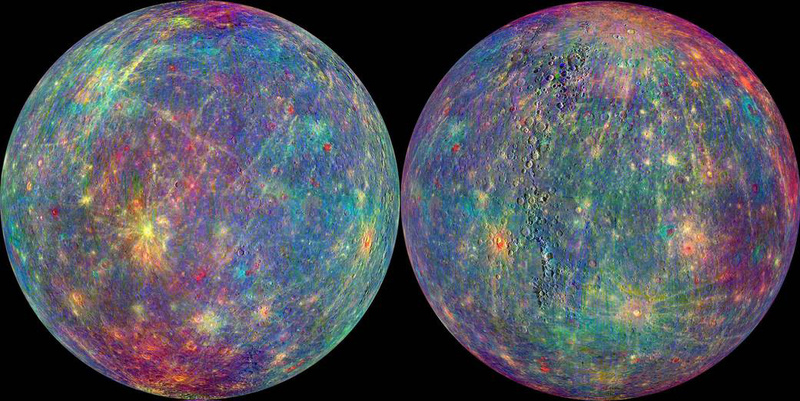 “Before MESSENGER, we thought that Mercury was the product of a high-temperature birth. Not only is Mercury rich in volatile elements such as sodium, potassium, and sulfur that would have been removed by high temperatures, it is also rich in carbon – the element essential to all organic chemistry,” said co-author Sean Solomon, a geophysicist who led the MESSENGER mission as principal investigator and is now director of Columbia University’s Lamont-Doherty Earth Observatory. “Our view of how the building blocks of the planets, including those critical to the origin of life, were distributed across the early solar system has been permanently changed,” Solomon said. The carbon detected by MESSENGER as it orbited Mercury from 2011 to 2015 was likely present when Mercury formed from the solar nebula some 4.6 billion years ago, the authors write. The chemical composition of the planet today also suggests that the cloud of dust and gas from which Mercury formed was chemically distinct from the other inner planets of the solar system, in that it was chemically more reduced. One of three areas of low-reflectance material studied, from Peplowski et al., 2016. In the study, the scientists focused on three large dark areas of low-reflectance material (LRM), all in or near craters that excavated material from great depth within Mercury’s crust. 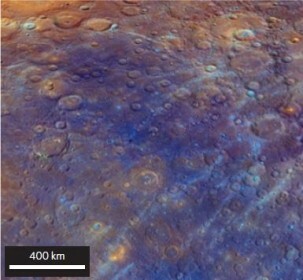 Scientists analyzed the elemental composition of the low-reflectance material using data collected by the spacecraft’s X-ray, gamma-ray, and neutron spectrometers during the final days of the MESSENGER mission, when the spacecraft flew within 100 km of the planet’s surface. No single measurement confirmed the source of the darkening, but a combination of data from the three sites – including elevated thermal-neutron count rates, lower iron-to-silicon concentrations, and consistent low reflectance – ruled out some alternative ideas and fingered graphite as Mercury’s dark component. In data from the neutron spectrometer, the scientists found increases in low-energy neutrons in the areas of low-reflectance material, suggesting high concentrations of an element inefficient at absorbing neutrons. For Mercury, only carbon fit that description. Like Earth’s Moon and the other inner planets, Mercury likely had a global magma ocean when it was young and the surface was very hot, said co-author Rachel Klima, a planetary geologist at the Johns Hopkins University Applied Physics Laboratory (APL). “Experiments and modeling show that as this magma ocean cooled and minerals began to crystallize, minerals that solidified would all sink, with the exception of graphite, which would have been buoyant and would have accumulated as the original crust of Mercury,” she said. Over its four years orbiting Mercury, the MESSENGER (MErcury Surface, Space ENvironment, GEochemistry, and Ranging) spacecraft photographed the surface, found ice at the poles, and collected data on the chemistry of the planet and its atmosphere. It found that Mercury’s large core is largely fluid, that the planet’s magnetic field appears to be generated by an active dynamo in the core, and that such a dynamo was also operating 4 billion years ago. MESSENGER’s data are still being analyzed for a wide variety of studies of the planet’s surface and atmosphere, and many questions remain about other minerals that make up the crust. The European Space Agency plans to launch a dual spacecraft mission to continue studying Mercury’s origin, geochemistry, and atmosphere in 2017. It should arrive in 2024. The other scientists involved in the Nature Geoscience paper were lead author Patrick Peplowski of Johns Hopkins University Applied Physics Laboratory and co-authors David Lawrence, Carolyn Ernst, Brett Denevi, John Goldstein and Scott Murchie of APL, and Elizabeth Frank and Larry Nittler of the Carnegie Institution of Washington.